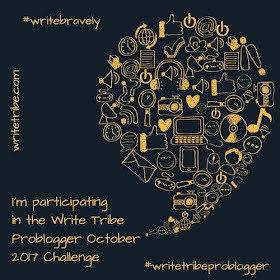 I am fascinated by the changing colors of leaves in the fall season. The nature is always beautiful but the beauty enhances when the leaves of trees change to a golden hue and then to bright reds. This small but beautiful town Aspen in Colorado Rockies is famous for skiing in winter. But, Summer and fall are also great to visit this place. Aspen is at an elevation of 8000 ft above sea level. 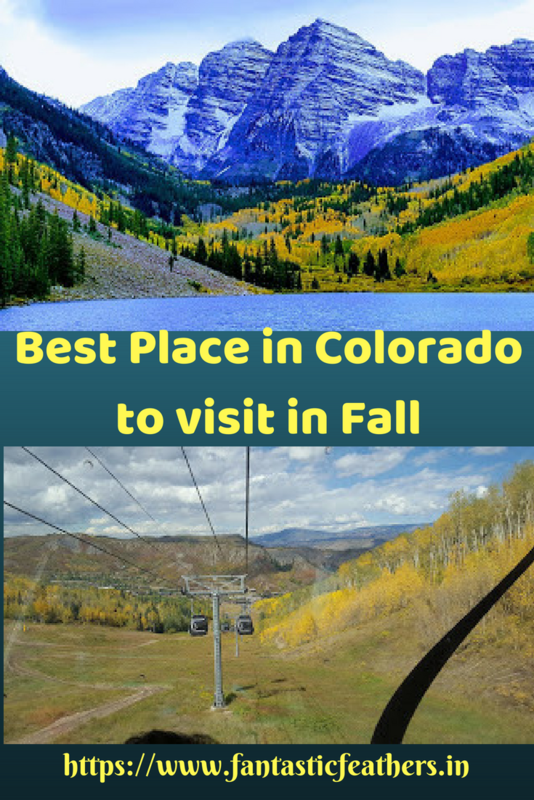 This place is famous for mountain biking in Summer, to view fall colors in the Fall and enjoy skiing in winter. Isn't it great? The Maroon bells is an ideal location to view the splendor of fall colors. 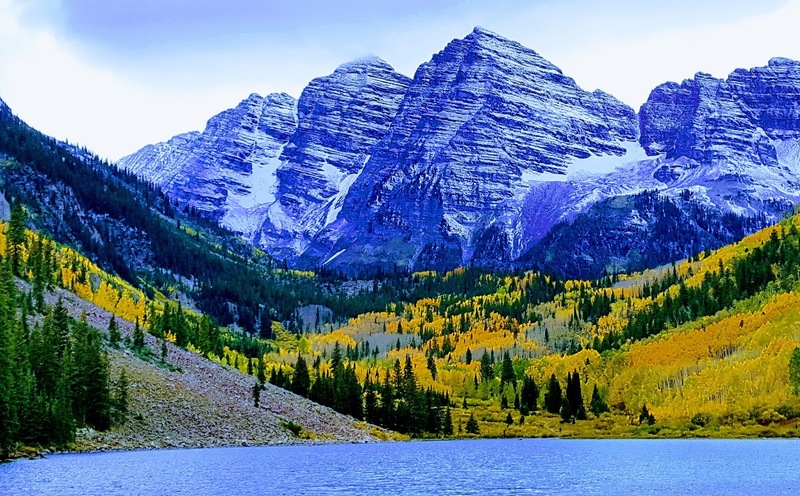 This lake with the backdrop of snowy mountains and orange trees is the most photographed place in Aspen. The beauty of the scenery doubles when the fall colors reflect in the water. Maroon bells recreation area charges $10 per vehicle after 5 Pm and visitors can tour the lake between 8 Am to 5 Pm by a shuttle bus (adult - $7, kids - $5) from Aspen Highlands. This recreation area has several trails and camping grounds. Crater Lake trail and Maroon lake trail are popular. Maroon lake trail is an easy 1-mile loop around the lake. 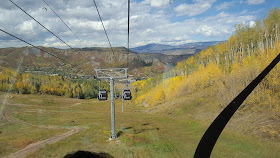 Since this is a skiing town, Aspen and the neighboring town Snowmass have Gondola and Chairlift rides for the visitors. The Silver Queen Gondola in Aspen is the longest single stage Gondola in the world which takes its visitors to an elevation of 11,212 ft. The Sundeck restaurant on the top of the mountain is amazing with 360-degree views of the mountains. 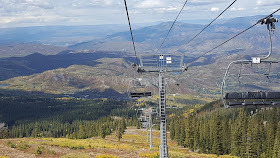 Snowmass is the largest of all the four mountains in the Aspen/Snow mass area(Aspen, Aspen Highlands, Buttermilk). There are around 17 lifts. Elk Camp Gondola in Snowmass is open in Summer as well and the chairlift takes to the summit. Elk Camp restaurant has all varieties of food from Soup to Pizza and the food is tasty too. Chairlift is an entirely different experience. We enjoyed Chairlift in Snowmass more than anything else. Summer Package worth $33 can be purchased online at https://www.aspensnowmass.com/. 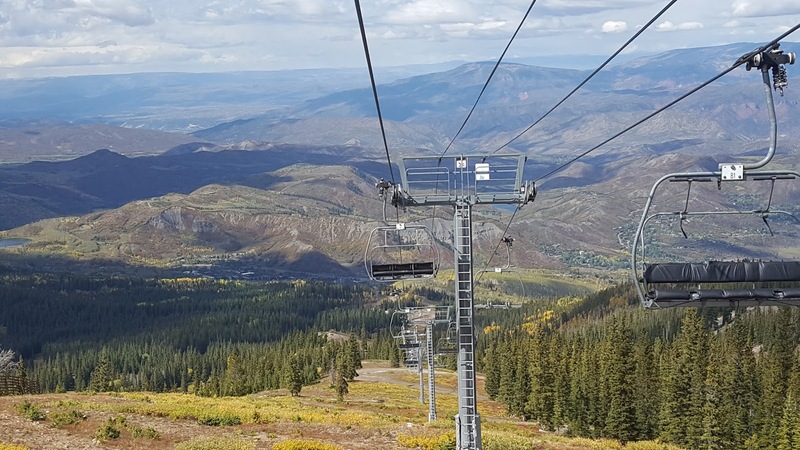 This package includes Gondola in Aspen, Snowmass, Chairlift in Snowmass, On mountain activities for kids, $10 lunch credit at Elk Camp restaurant and $5 beverage credit at Limelight longe. We felt this package is good value for money. We found beautiful fall colors on the way to Aspen near Independence pass, from the Gondolas in Aspen and Snowmass and at Maroon Bells. 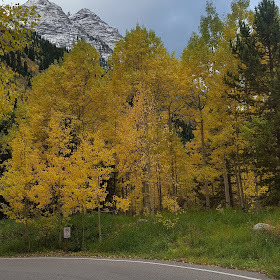 Especially, the way to Maroon bells is in bright yellow hue. 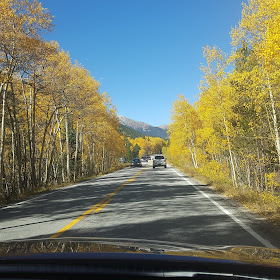 It is beautiful country - it's been almost 40 years since I've seen Colorado in the fall. It is well worth the trip. True Alana. Loved the trip. Wow, this place is so beautiful. I hope that I get to visit Aspen soon. Loved the pictures, Mahathi. Were these clicked by you? It is one of my dreams to see these beautiful fall colors. Such beauty. The golden leaves look like paintings.I don't think I'd want to come back from this beautiful place to the ordinary green leaves on simple trees :) Lovely post. Thanks Amrita. 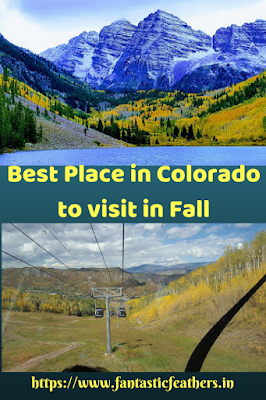 Chairlift and Gondola are the best memories of the trip. I love the gold and orange of the fall, though I have yet to actually see it in real life. Till that happens I have to satisfied with pictures. Thanks for sharing. Lovely pics and a wonderful write-up which is not only informative but well-presented too. Beautiful pictures. I'd love to visit Aspen some day. Wow! I am falling in love woth these lovely pictures! Such vinrant colours and such natural beauty. Just wonderful! You have a way with words! Your pictures are lovely too. Someday I would like to visit. Wow! The fall colours look amazing! Looking forward to visit such a place some day! Thank you for this virtual trip. The place looks amazing. I love leaves and trees, so I really liked these pix.